Blu-ray and DVD are the types of optical memory where blu-ray provides larger space for storing HD videos while DVD offers less space. Blu-ray is earlier technology and the primary motive to devise it is to provide a more efficient and superior technology that is compatible with newer tech. Back in earlier days, we used LDTV and VCD then with the advancement in the technology, enhanced televisions with larger screens were developed from CRT to LCD and LED. This lead the development of SDTV, EDTV and HDTV which worked fine with a larger screen and displayed smoother picture quality. So, blu-ray served as the disk format for high-quality digital videos. Basic Stores digital data including HD videos. SD videos can be stored easily. Blu-ray is a high definition optical disk which can hold a greater storage space as compared to other optical storage devices. It was mainly devised to store high definition videos, and this was not possible in the previous DVD technology. The Blu-ray name is originated by merging blue and optical “ray” and this because it uses blue-violet laser instead of a red laser. As the blue laser’s wavelength is shorter, it helps in achieving higher bit density. Due to the shorter wavelength, the data pits in the high definition optical disk are tiny. The data pits are used to form the digital 1’s and 0’s. Among all the disk formats (HD DVD and Blu-ray Disc) competing for the market acceptance, the Blu-ray scheme gained extreme market dominance. 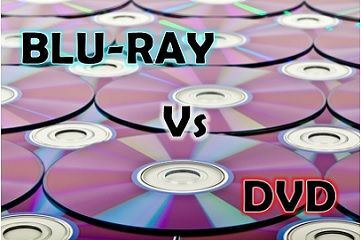 Blu-ray can store the enormous amount of data as compared to other disk formats, and the reason behind this is the less gap between the data layer on the disk and the laser. It generates tighter focus, less distortion and smaller pits (and tracks) as an outcome of placing the laser closer to the disk. The maximum storage space of Blu-ray is 25 GB on a single side. DVD (Digital Versatile Disk) is a technology generating a digitized compressed representation of video information and other digital data. It was a replacement for the analog VHS tapes used in the video cassette recorders (VCRs) and CD-ROM used in personal computers and servers. You can refer to the article difference between CD and DVD for getting more information about the differences between CD and DVD. It provides a better picture quality than VHS and CD, where a massive amount of data can be loaded onto the disk. A red laser is used in DVD, which has a longer wavelength and larger area to focus thus less amount of data is fetched relative to the blue laser. However, it was better than using a red colour laser than the infrared laser. The data pits are also larger in a DVD. DVD also introduced a negative dispersion effect known as birefringence, which causes the refraction of the laser light by substrate layer into two distinct beams. If the beam is split too broadly, the reading of the disc can be ceased additionally, if the DVD surface is not entirely flat hence not perpendicular to the beam which can result in disc tilt and distorted laser beam. The discrepancy usually occurs in the manufacturing process. The blu-ray optical disks perform better than DVD in terms of storing high-quality data, comparatively. 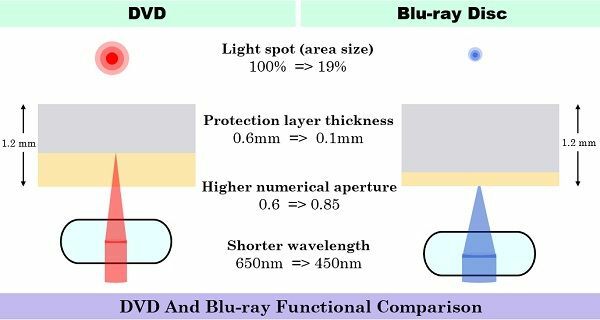 In DVD the red laser is used to fetch data whose wavelength is 650 nm while blu-ray uses a blue-violet laser in which wavelength is 405 nm. DVD can store 4.7 GB in a single layer and a maximum of 7.4 in the double layer. As against, blu-ray has maximum space of 25 GB in a single layer while 50 GB in a dual layer. Blu-ray provides a higher data rate that is up to 36 Mbps whereas the DVD rate of data transfer is 11.08 Mbps. Blu-ray is more secure and protected. It has a large amount of capacity. Provides high density as compared to CD. Cost effective relative to CD. Compatible with most older and current DVD writers. Its cost is quite high. However, the blu-ray is capable of storing high definition videos but in a limited way. Data transfer is slow as compared to blu-ray. Storage capacity less and can not store HD videos. The Blu-ray can hold up to 50 GB of data in a dual layer which is 6.7 times of a dual layer DVD. So, it is clear from the fact that blu-ray provide high storage space, data rate, security, compatibility as compared to DVD.